Peerless HDS-205 AL 835026 woofer Speaker is a member of the famous Peerless HDS High Performance range. This 8" 8 ohm mid-woofer drive unit has a 38.40mm 1¾" Long Throw voice coil, featuring an Aluminum cone with a linear spider and rubber surround. FREE UK DELIVERY. A Product Datasheet, Application Note and Architecture Notes can be downloaded from the Product Description page. Peerless HDS 205 AL 835026 Woofer Speaker is a member of the famous Peerless HDS High Performance range. 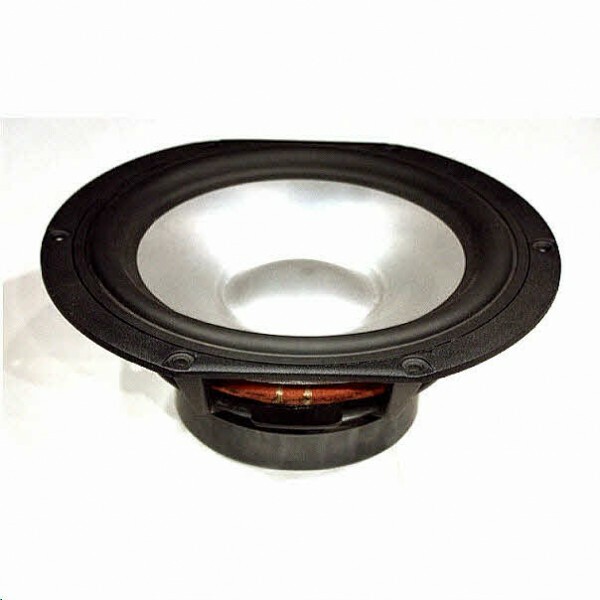 This 8" 8 ohm mid-woofer drive unit has a 38.40mm 1¾" Long Throw voice coil, featuring an Aluminum cone with a linear spider and rubber surround. The cone neck is vented to reduce air compression effects at high excursions. Ferrite magnet, aluminum shorting ring for extended frequency and low distortion with reduced inductance, finished with a vented Aluminum basket acting as a close-coupled heat sink for high power handling and additional cooling. A Product Datasheet, Application Notes and Architecture Notes can be downloaded by clicking on the appropriate .pdf logo (where shown).